Fat and Happy Blog: Where did all the Free Popcorn go? When we moved back to Chicago from Denver, one of the things Dave was most excited about was the free popcorn available in every bar you walked into. This is by no means a 'new' tactic. For centuries, bars have offered free salty snacks to hungry patrons. If you don't understand this concept, look at it this way. The more salty snacks one eats, the thirstier one gets, and the more one drinks. It's that simple. And if you're saying 'what about the food costs?" Well, nobody ever claimed these were expensive snacks by any means. These are typically the cheapest, oldest snacks available! But in true American form, we sit at that bar and eat and eat and eat the heck out them. I say Americans because the truth is, we overindulge. We don't know when to stop and we don't know how to monitor our eating habits. I saw this proven on a trip to Venice. In Venice, it is customary for Italian's to stop into a cafe/bar on their way home from work for a quick drink. During this time, I think it was from 5 to 7, these cafes would place out free small plates of olives, cheeses and the like. It's like Italian happy hour and I believe there was an actual name for this, but I can't remember; so if any knows it, please write to me (cicheti maybe?). One night in particular stands out. The cafe was busy with Italian and a handful of Americans. We would watch the Italians come in for one or two quick drinks, maybe take one olive, then leave. The Americans (myself included) stayed for many drinks (nothing wrong with that!) but would eat these free small plates like it was their dinner. Gorging themselves on these appetizers until the plates were empty, then asking for more. The Italians never sat either. Americans made camp! In any case, this special treat of popcorn or snacks was not followed in Denver. It makes me wonder if this is now a regional thing? Or is this practice just going by the way side? 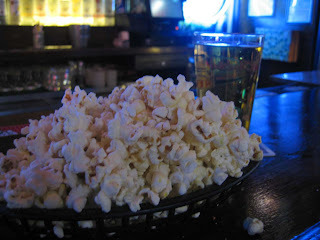 Even now in Chicago, it's hard to find those bars that offer the free popcorn. Last night we were watching the Patriots edge out the Jaguars at Joe's on Weed. Joe's is a huge sports bar/club next to North Beach Bar, which is where we were playing indoor sand volleyball. North Beach didn't start serving beer for another hour, so we had to find a new place; after two hours of sand doubles, you really want a beer! The waitress got a kick out of how much popcorn we could eat. There is also this ritual we play (I have no idea where this came from) where we try to throw popcorn in everyone's beer. Silly, I know, but fun! Another really outstanding free snack place in Chicago is Lawry's. They set out baskets of big homemade chips. It's important to note that they only do this at lunch, which I found out after bringing some friends there for a pre-dinner drink and snack...Doh! Stop and Drink (great name by the way!) on Clark and Chicago offers not web site but big pretzel sticks. I have found them to be stale every time I've had them...but again, this doesn't seem to deter me or any one around me from eating them. Let me know of the great free snack places you enjoy in your town and I'll share it with everyone. Look for a posting called The great lost free snacks coming soon!